Here's a beta version of Sweet Home 3D 4.4 that you can test. Please also try if SunFlow works better for you, and don't hesitate to report any issue. You can test the transparency on texture with this new curtain that will be released in next version of furniture libraries. 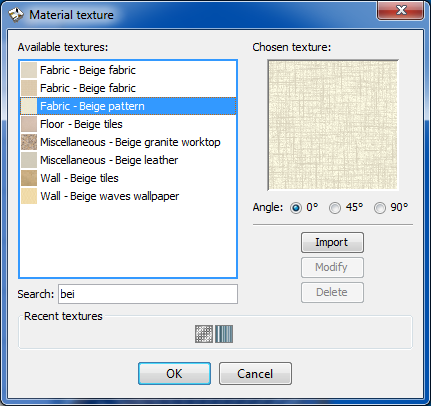 Texture selection has been on my wishlist for a long time. Thank you!! Will test as much as I can and report any issues. So much for all my vertical and horizontal textures First look - great! Looking forward to trying new features. Congratulations. First bug: plug-in Rotate doesn't work properly anymore. Texture module works like a charm. Great work! Modify materials (blinking) is a great addition as well! Note: making a photo in Q4 is extremely slow. I don't think this plug-in ever worked with Java Web Start for security reasons. making a photo in Q4 is extremely slow. Again congratulations. It is so nice to see new sw versions that actually improves stuff. Also, no crashes, nothing unexpected so far. Still get (the same) black dots using both versions with photo from same setting - will look some more. I noticed no performance differences at best setting, though. - new dropOnTopElevation property to place .. at a preferred elevation.. If I understand you correctly a dropOnTopElevation#1=82 means that other furniture you later import (on top) will end up with an elevation of 82? Regardless of whether the item is higher or lower? If so, this could be useful. - new Furniture > Reset elevation ..
Reset to the elevation to previous value? Not to the original elevation#nn= value? I am sure many users will appreciate easier access to the 3D warehouse. I think maybe you are at a point where selecting which items to include (in default library) is getting to be difficult. But then, as a puritan I would prefer the basic selection to be simple, compact and generic. Fully realising that many (most) would probably disagree. Good luck - and thanks! Yes, you're right. I made some other tests. There was no performance loss but there were as much black dots as previously. Since its original developer haven't touched this library for years, I think it's a dead end now. I spent so much time trying to manage texture transparency and feel it's still not perfect. I guess better renderings can be achieved only if I now integrate an other library. If I understand you correctly a dropOnTopElevation#1=82 means that other furniture you later import (on top) will end up with an elevation of 82? Regardless of whether the item is higher or lower? Yes it's exactly this behavior. It should help to place accessories much faster on some tables, shelves, cabinets, but also under trees, plants… If this property is negative, the height of the surrounding object will even been ignored. Reset to the value that would be used if you set elevation to 0 then drop the piece of furniture again on a surrounding object. So not to the original elevation#nn value. Users will appreciate it mostly once Trimble will have added back a filter for KMZ files in 3D Warehouse search engine, like I requested some time ago (feel free to post yourself a message to show you want this filter too). We will see in the future how to handle this at best, and why not proposing libraries organized by themes. At the moment, my goal is to reach 1000 models for Sweet Home 3D available under a free license, and we're very close. Expect a nice surprise with version 4.4. Thanks - anyway, very happy. Not too concerned with the black dots either. 1000 models, easy, which ones, that is the hard one. Exception in thread "AWT-EventQueue-2" java.lang.IllegalArgumentException: Value too long: Stairs 90 closed legal high,Roof,toalettslange,tallerkenhylle,……..
bug #415 doesn't happen all the time. It must depends on how many new words you entered during a session of Sweet Home 3D. Aha, thanks, the mysterious bug #415 has been a pain. Strange list, though. ".. a session..." you say? Certainly not from a recent session. Even one of the very first models I imported was there, never used since. I looked at \eTeks\Sweet Home 3D\preferences.xml - it is the autoCompletionStrings, right? <entry key="autoCompletionStrings#3"> (3 of 4): 557 entries, 8190 characters (including commas). Or even better, could I just clean out the whole top settings directory: settings, textures and furniture (not the sub-dirs with furniture- and texturelibraries) to wash out all test-stuff ?